Paintings by Pablo Picasso again dominated the field at Sotheby’s slow but steady Impressionist, Modern and Surrealist Art evening sale, coaxing the £136/$188.8 million tally to exceed expectations. Eleven of the 47 lots offered went unsold for a relatively decent buy-in rate by lot of 23.4 percent. The result, including fees, topped pre-sale expectations of £101,650,000-126,400,000/$141,334,160-$175,746,560. That figure, however, lagged behind last year’s stellar £194,753,500/$240,832,178 result for the 48 lots sold and led by Gustav Klimt’s “Bauemgarten (Blumengarten)” painting from 1907 that fetched £47.9/$59.3 million. The hammer tally (before fees) raised £117,773,000/$163,574,920, still nimbly ahead of the pre-sale figures. Eighteen works sold for over a million pounds and of those, six topped £5 million. Dollar wise, twenty-six made over a million dollars and seven made over $5 million. One artist record was set for a rare and exciting Italian Futurist work by Umberto Boccioni. All prices reported include the hammer price plus the stepped buyer’s premium for each lot sold calculated at 25 percent of the hammer price up to and including £180,000, 20 percent for anything in excess of that up to and including £2 million and 12.9 percent for any amount above that. 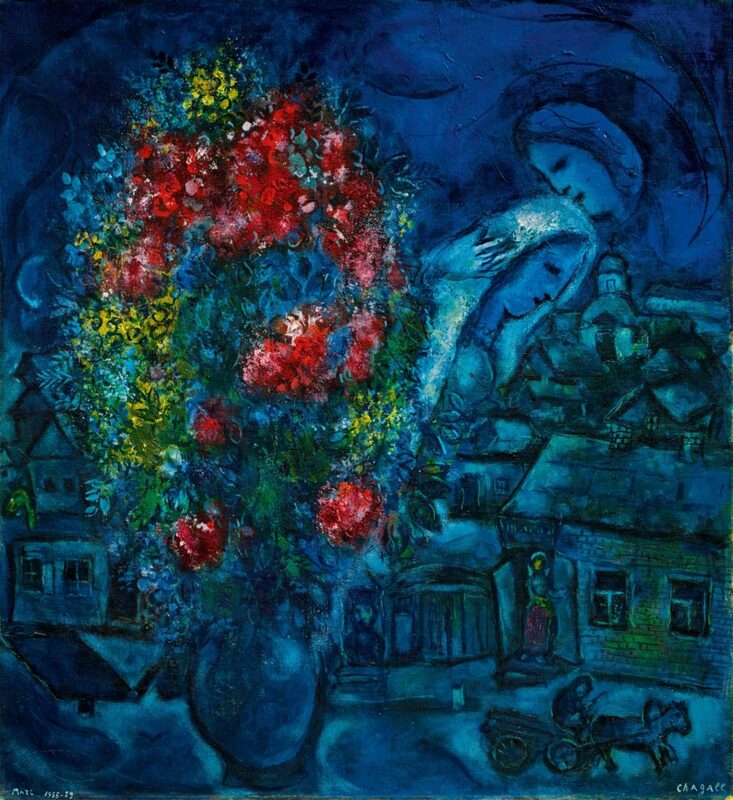 The evening got off to a racy start with Marc Chagall’s floral festooned composition of a Russian village with floating figures, “Le Village bleu” from 1955-59 that made an estimate crushing £3,650,900/$5,070,735 (est. £1.5-2.5 million). But that early spark faded as bidders got picky and the tempo slowed despite the earnest urging of auctioneer Helena Newman. 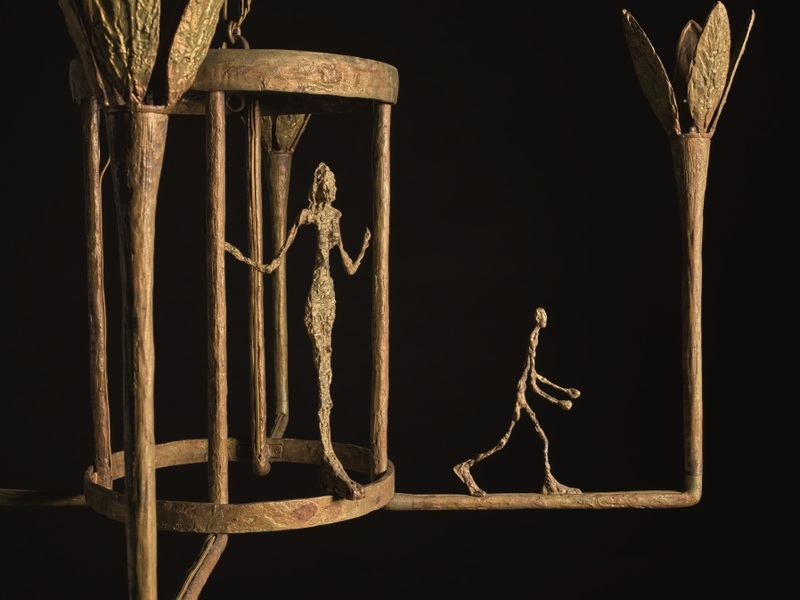 That said, a spectacular and rare cast bronze chandelier by Alberto Giacometti, “Lustre avec femme, homme et oiseau” from a circa 1952 edition of three, sold to an anonymous telephone bidder for £7,602,400/$10,558,973 (est. £6-8 million). It hung, as a decorative object, rather gloriously in a room adjacent to Sotheby’s Georgian era New Bond Street salesroom. Later in the sale, a Giacometti bronze sculpture, “Buste d’homme sur socle” from a posthumous casting dated from an edition of ten in 1990 reached £1,809,500/$2,512,520 (est. £400-600,000). It last sold at Sotheby’s London in February 2002 for £201,500, showing the market’s increasing acceptance of posthumous bronzes by the artist. In other words, there was no touch of Giacometti’s hand in the bronze. 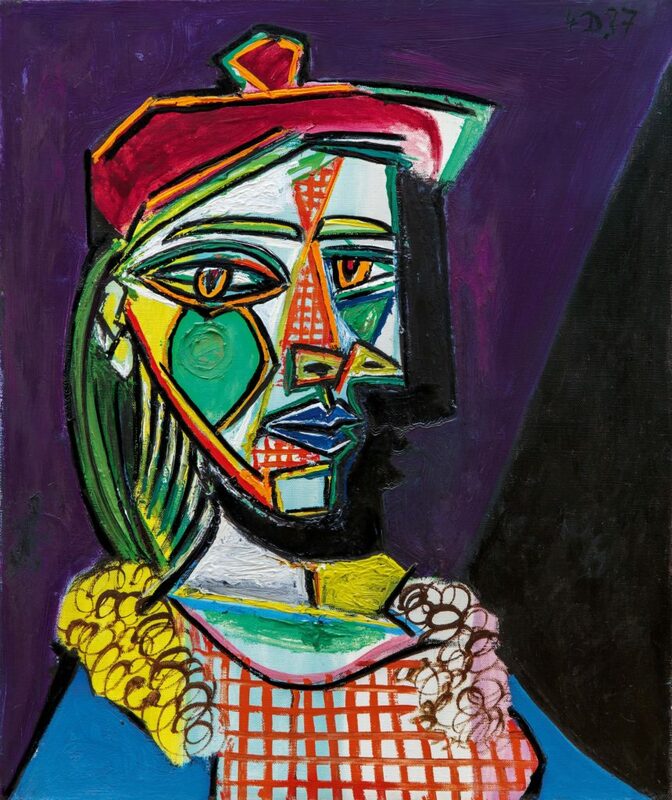 The main event of the evening was the cover lot Pablo Picasso, “Femme au beret et a la robe quadrille (Marie-Therese Walter)” painted on December 4, 1937 that sold (seemingly at least), to an anonymous telephone bidder for the top lot price of £49,827,000/$69,204,720 (unpublished estimate in the region of £36 million). Painted the same year as the artist’s famed “Guernica” and the onset of his seminal “Weeping Woman” series, the portrait is cannily autobiographical since the clear image of new mistress Dora Maar is dramatically shadowed over the unmistakable likeness of Marie-Therese, the artist’s younger muse and love interest. Museo Nacional d’Art de Catalunya, Barcelona. It ranks as the sixth most expensive Picasso sold at auction and the second most expensive work of art sold at auction in Europe, topped only by Alberto Giacometti’s “L’Homme qui Marche I” from a 1961 bronze cast that fetched £65,001,248/$103,935,480 at Sotheby’s London in February 2010. Picasso, at least this season, remains the unrivaled lion of the Impressionist and Modern salesroom. That said, bidding was agonizingly slow for the 21 5/8 by 18 1/8 inch oil on canvas, opening at £32 million and after £40 million, or so, increments crept along at £200,000 mini-jumps, turning the salesroom into a sleepy chamber. Ultimately, and waiting till the perfect moment, Sotheby’s seasoned specialist Mark Poltimore stepped into the fray and took the winning bid from an anonymous phone bidder. The picture, never before at auction and bearing the earlier provenance of the artist’s estate, was backed by an irrevocable bid, a form of third party guarantee that assures the work will sell for a minimum price amenable to the anonymous consignor. It didn’t seem to need the insurance. 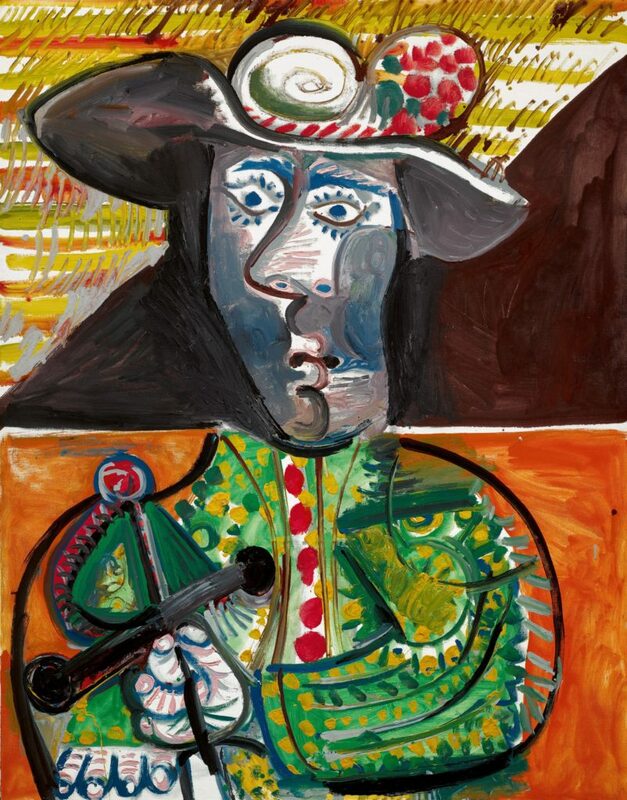 Another Picasso, the late and totally contemporary “Le Matador” from 1970, featuring the elaborately costumed and wide-eyed figure clasping his bull-killing sword and set against the sand pit of the packed arena, sold for £16,521,500/$22,946,711 (est. £14-18 million). It was included in the historic Avignon Palais des Papes Exposition of 200 late Picasso paintings in 1973 and was numbered ’22’ in the catalogue. A third Picasso, “Tete de femme” from 1963, featuring the dark haired features of Jacqueline Roque, sold for £6,360,500/$8,834,098 (est. £5-7 million). It last sold at Sotheby’s New York in May 1998 for $947,500. Though the auctioneer didn’t announce, as is customary, the paddle number, the winning bidder was Harry Smith of the art advisory firm Gurr Johns, who also nabbed Picasso’s Matador and according to a reliable trade source, was funneling bids to Poltimore to win the top lot Picasso. One can only wonder, at this point, what deep-pocketed client is hoovering up all these Picasso works at auction and what kind of advice does that merit? 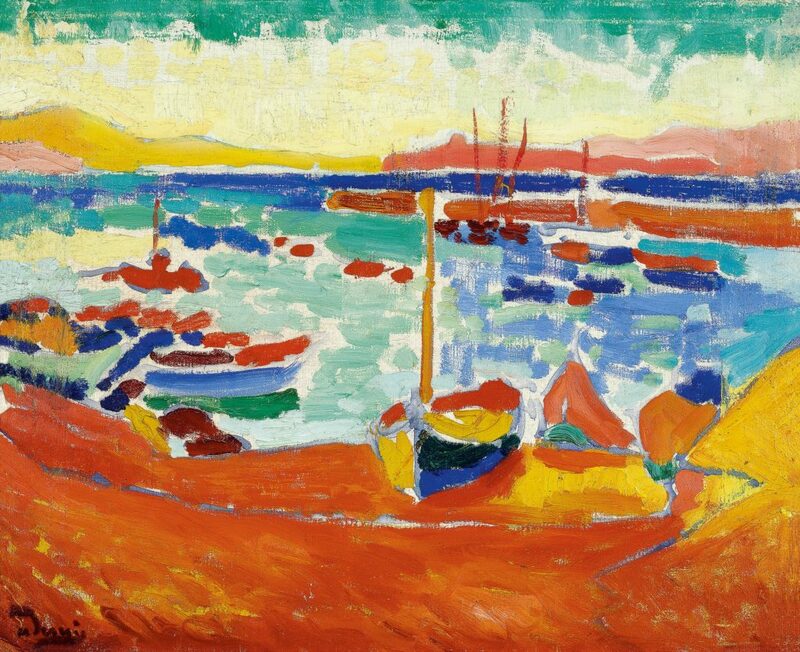 Apart from the Picasso parade, strong prices were realized for the lovely but petite Andre Derain color saturated Fauve canvas, “Bateaux a Collioure” from 1905 that hit £10,876,500/$15,106,371 (est. £7.5-10 million) and the rare to market Futurist beauty, Umberto Boccioni’s stunning “Testa + Luce+ ambiente” oil on canvas from 1912 that sold for a record £9,070,100/$12,597,462 (est. £5.5-7.5 million). The effervescent Derain, once handled by the famed and early French dealer and collector Ambroise Vollard, last sold at Christie’s London in February 2011 for £5,865,250. 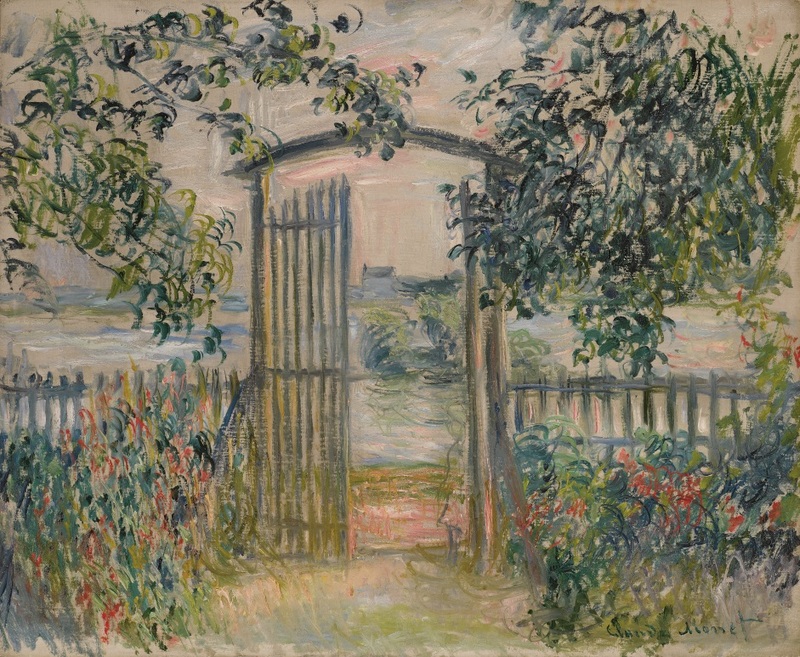 There were very few top class Impressionist works on offer, with Claude Monet garden vista hitting the top ten lot makers with the gently jeweled “La porte du jardin a Vetheuil” from 1881 selling for £3,086,400/$4,286,701 (est. £2-3 million). It last sold at Christie’s New York in May 2007 for $2,728,000, a rather flat line indicator in value over an eleven year period. 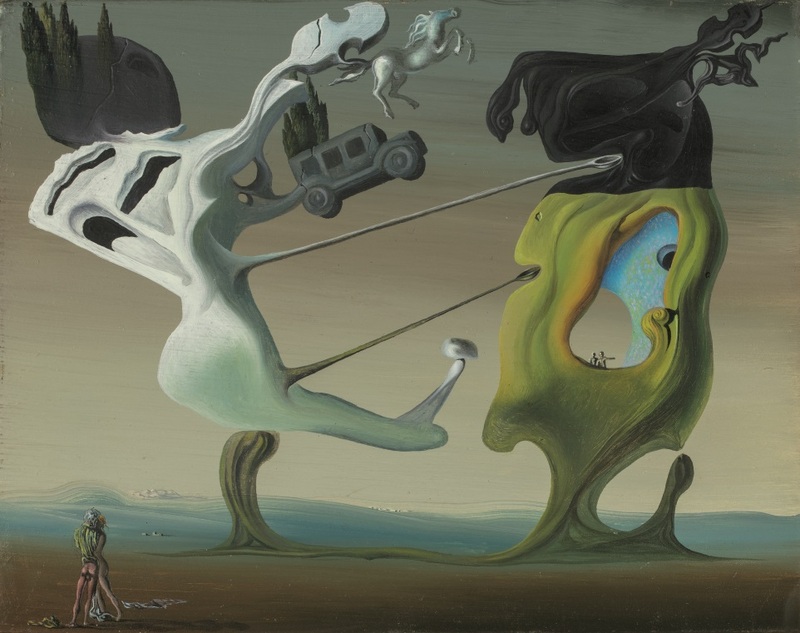 In the slender Surrealist Art, separate catalogue section, a luscious trio of small scaled and early works by Salvador Dali toppled expectations, led by the extraordinary and dream like composition, “Maison pour erotomane” from circa 1932 and executed in oil on panel that soared to £3,538,000/$4,913,928 (est. £1.2-1.8 million). The trio of Dali paintings from the collection of Condesa Cuevas de Vera were bought via telephone through Patti Wong, chairman of Sotheby’s Asia. The evening action in London resumes next Tuesday at Christie’s Post-War & Contemporary art sale. This entry was posted in Blog and tagged Alberto Giacometti, Guernica, Gustav Klimt, Helena Newman, Marc Chagall, Pablo Picasso, Sotheby’s. Bookmark the permalink.